This has been a long time coming. A couple of years ago before Tom and I lived together I made him a killer batch of homemade chicken tenders. They were crispy and flavorful on the outside and juicy on the inside. We both flipped over them. Chicken fingers are one of Tom’s favorite foods ever. He’d eat them at least every week if I made them that often but I was kind of indifferent about them until I had these. I was craving them again almost immediately after they were gone. The kicker? I never used a recipe and I could not FOR THE LIFE OF ME remember what the heck I used. Many, many disappointing batches of chicken fingers made appearances in my kitchen before I finally gave up. Recently I decided I wanted to give it a go again. I knew Tom would be stoked and I was just really, really craving a good chicken finger. I got really close to a winner with a batch two weeks ago, but last week’s was when I hit gold. The star ingredient? Cornflakes. They give a great toasted flavor and extra crunch. These are the best chicken fingers I’ve ever made. Ever ever ever. And the good news is that I wrote the recipe down this time so you can make them too. Preheat your oven to 450 degrees. Line a large baking sheet with parchment or Silpat. Brush with olive oil and set aside. In a shallow dish, mix together the cornflake crumbs, bread crumbs, flour, seasoning salt and pepper. Fill a small bowl with milk or water. 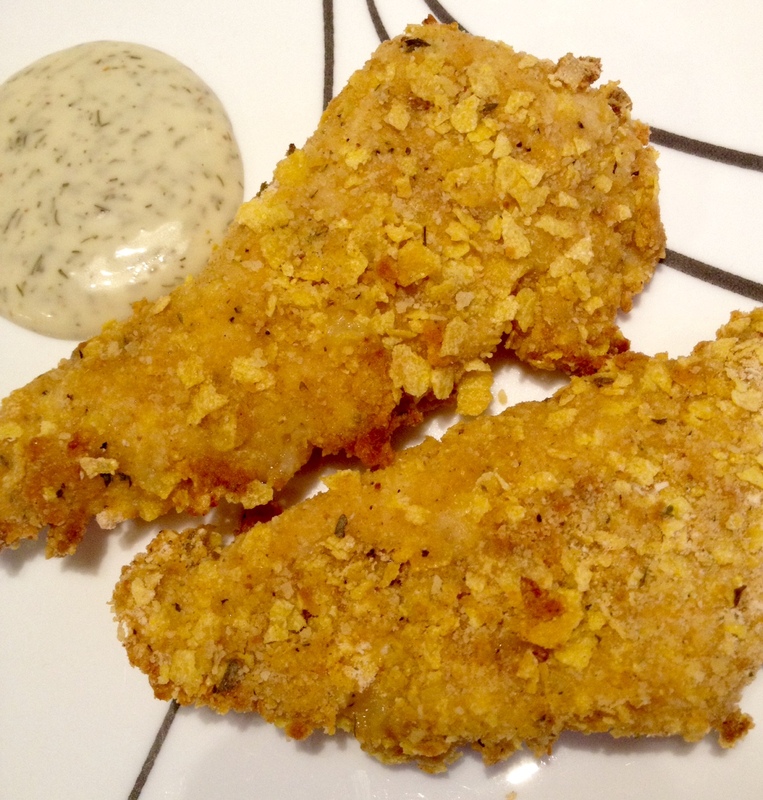 Dip each chicken tender in the milk or water and then press into the bread crumb mixture, making sure to fully coat. I like to really push them into the crumbs so the moisture on the chicken picks up as many crumbs as possible. Place the coated chicken tender on the prepared baking sheet and repeat with the other chicken pieces. Brush the top of each chicken tender with olive oil. I like to use a silicone brush for this. Bake for 30 minutes, flipping halfway through and brushing with olive oil again. Once cooked through, remove from oven and serve with your favorite dipping sauce.